​This famous film actress, who revealed her true personality in the songs she chose for her recordings, and for concerts on stages around the world, gave her first recital as a diseuse of considerable talent at the Las Vegas Sahara in December 1953. She wore a fabulous black sequined gown, surmounted a trailing white fur redincote, and the effect on that first audience was simply stunning. Some the songs that night came from her films...FALLING IN LOVE AGAIN, here in its original version, LOLA-LOLA and JOHNNY, of course need no introduction...although Marlene has never been as keen on these numbers as she was on her realiste songs, which turned up later in her career. She herself told me th reason for this: her film songs were not written for her, but for the characters she portrayed. A great many spectators...and journalists in particular...had too often associated her with the parts which she had played in her films, and this was an unforgiveable error. 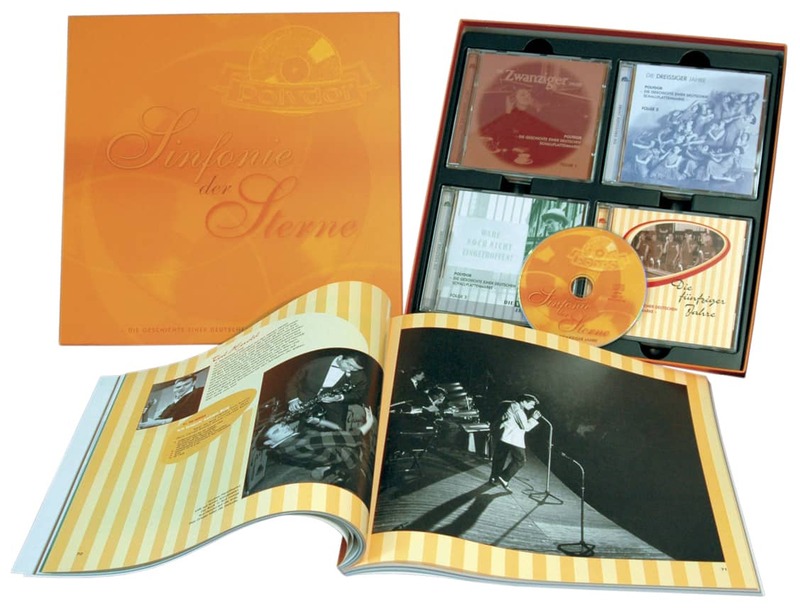 Marlene's unique artistry and courage of conviction means that she will go down in history as considerably more than a movie legend, and considerably more than just any other singer. Quite simply, she will etenally remain the greatest legend of all time. To the French and the Americans in particular, Marlene remains an institution, and a potent symbol of all that is intensely patriotic. For her tireless work during World War II, and for her indomitable courage, she was awarded the Congress Medal of Freedom and the prestigious Legion d'Honneur. France, she has often said, is the country which contains her heart and included in this album are several songs which she sang in her one-woman shows at the Paris Olympia and Theatre de l'Etoile. DEJEUNER DU MATIN was written by Jacques Preyed and Joseph Kosma, famous for AUTUMN LEAVES, way back in 1930, and recorded by Marlene after the title had been changed from SANS ME PARLER. It tells the deceptively simple story of a man pouring a cup of coffee before leaving the woman he loves. Marlene told me that this was one of her most cherished songs. OU VONT LES FLEURS, the French-language version of Pete Seeger's WHERE HAVE ALL THE FLOWERS GONE, is now issued in Britain for the first time and serves to remind us of Marlene's paramount importance as an authority on the human condition and an ambassador for world peace. Very much in the same intrinsic vein is her legendary version of Bob Dylan's BLOWIN' IN THE WIND, and Mischa Spoliansky's AUF DER MUND-HARMONIKA, which she recorded in 1964. In 1954, Marlene appeared at London's Café de Paris, where she was introduced by Noel Coward. Though some of her songs still came from her films, there were many which did not, thus reflecting on the fact that Marlene knew exactly what kind of song to sing, and exactly where to position it in her recital. 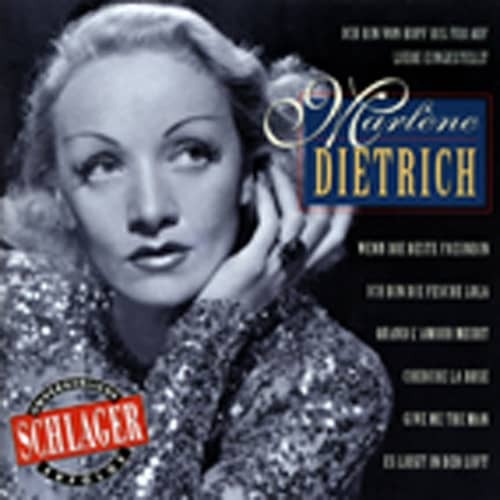 The dialogue between songs was equally well-chosen and sincere...never more so than before LILI-MARLENE which, though sung on the Continent by a number of artistes, will never belong to anyone but Marlene Dietrich. In 1960, Marlene sang in Germany for the first time since THE BLUE ANGEL, giving a splendid recital at Berlin's Titania-Palast She was mobbed in the streets before and after her show by adoring fans, and photographed with the young singer-actress Hildegarde Knef, yet another star whose true personality was brought to the fore by her stage performances. By this time, Marlene's choice of material had intensified with such songs as ALLEIN IN EINER GROSSEN STADT, WENN DER SOMMER WIEDER EINZIEHT and DIE WELT WAR JUNG...this latter song had first been introduced by her great friend Edith Piaf in 1952 as LE CHEVALIER DE PARIS, and had won the GRAND PRIX DU DISQUE that year. Marlene sang it without the slightest hint of emulation. Indeed, it is an uncontestable fact that when she interprets any song which has not been created and introduced by her, previous renditions of that song inevitably fade into oblivion. In November 1963, Marlene appeared in the Royal Variety Show, and later sang in a concert at the Albert Hall for the 8th Army Reunion. This was followed, in 1964, by a sensational season at the Queen's Theatre...the premiere of this was recorded, and the album has subsequently sold several million copies worldwide. She then resumed her conquest of the world. Israel, Russia and Poland had already fallen under her spell, and now it was the turn of Australia and Scandinavia, where songs such as PETER and MEIN BLONDES BABY had the same appeal as they had in Germany during the thirties. The other songs on this album may not be immediately recognised by English admirers. LIEBEN OHNE LIEBE, recorded in 1931, did not come from one of Marlene's films - who could possibly forget the famous scene in MOROCCO where, immaculately-dressed in top-hat and tails, Marlene had sung Cremieux's celebrated pastiche, QUAND L'AMOUR MEURT, to French Foreign Legionnaire Gary Cooper, or that other song from the film, GIVE ME THE MAN? WENN DIE SOLDATEN and IN DEN KASERNEN are again songs telling of the irony of war, and contrast well with the tender WENN ER WIEDERKOMMT and DER TROMELMANN, which is of course the German language version of the famous LITTLE DRUMMERBOY. ICH WERDE DICH LIEBERN and AUF DER MUNDHARMONIKA are also important because they reveal one side of Marlene's talent not readily known...that of lyricist. As a singer, a woman, and a dear friend Marlene is unique. This is because everything she does or has done reflects her love of the human race. Like Martin Luther King, she is without equal. There will only ever be one Marlene Dietrich. Customer evaluation for "Unvergessliche Schlagererfolge"